Orbs from Puzzle & Dragons: Super Mario Bros. Edition. 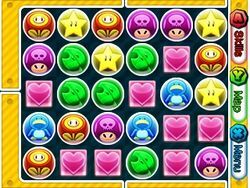 Orbs are puzzle pieces in the Puzzle & Dragons series that the player must match three or more in tile matching puzzles. They appear in five different colors (red, blue, green, yellow, and purple) in a 6-by-5 board called the Orb field. When the player moves Orbs around so that three or more line up horizontally or vertically, the Orbs disappear and new ones fill the Orb field from the top. There are five main types of Orbs that can appear on the Orb field: Fire Orbs, Water Orbs, Wood Orbs, Light Orbs and Dark Orbs. As their names imply, each Orb type represents the elemental attributes of enemies (Fire, Water, Wood, Light, and Dark). Heart Orbs represent life recovery. In Puzzle & Dragons: Super Mario Bros. Edition, the symbol for each elemental Orb takes on the appearance of several items in the Super Mario series: a Fire Flower for Fire Orbs, a Penguin Suit for Water Orbs, a green Super Leaf for Wood Orbs, a Super Star for Light Orbs, and a Poison Mushroom for Dark Orbs. In Puzzle & Dragons: Super Mario Bros. Edition, Orbs suddenly appear at Princess Peach's Castle. After inviting Mario to her castle to see them, Princess Peach is kidnapped by Bowser and the Orbs are stolen by his minions. Kamek casts a spell with the power of the Orbs to flood the Mushroom Kingdom with them. After receiving a letter from Bowser about Peach's capture, Mario and a Red Toad decide to use the power of the Orbs as well to defeat the Koopa King and rescue the princess. In each world, Orbs of varying sizes are scattered about, taking on their original appearance from the Puzzle & Dragons series. It is possible that these Orbs are "enhanced" into the ones on the player's Orb field, as implicated by a Light Orb and a Super Star fusing together with Kamek's magic in the game's introduction cutscene. Orb field, with all six Orb types. To clear Orbs from the Orb field, the player must match three or more horizontally or vertically. The player drags an Orb with to adjacent positions, swapping with the Orb already there. As long as the player does not let go of the Orb, they can move it as much as necessary within five seconds once they start moving it, allowing them to arrange for Combos in a single turn. After completing this, all matched Orbs are removed from the Orb field and accounted for as damage to enemies. The Orb field then cascades all Orbs down and fills the Orb field once more; this may result in more Combos, known as "skyfall Combos". Damage is based on what colors were matched in the Combos: for example, a basic Combo of three red (Fire) Orbs will have any teammates that is Fire-attribute deal its damage equal to its base attack (ATK) to one enemy (as indicated by their cards glowing that color briefly). When Heart Orbs are matched in a Combo, it restores health to the team based on the team's total health recovery stat (RCV). Combos of more than three Orbs increase the damage dealt for each additional Orb. Making multiple Combos on the same turn boosts all damage or healing for all teammates regardless of colors matched, while separate Combos of the same color further multiply the damage dealt. Single Combos of five or more Orbs activates an attack that hits all enemies on the field. Damage is affected by both the enemies' defense power and its attribute, for Fire damage against a Fire enemy will work, but will be boosted against a Wood enemy and decreased against a Water enemy, and so forth in a rock-paper-scissors relationship; Light and Dark enemies are solely weak to the other type. When making seven Combos, and every three Combos after that, a random elemental Orb on the Orb field turns into a radiating Super Orb which triples the attack power of a Combo that it's matched in (causing any teammates of that matched attribute to glow in multi-color), unleashing a flashy attack. Each additional Super Orb within a Combo raises its ATK by another three times (x9 for two, x27 for three, etc.). Teammates such as Gold Goombas have Skills that create Super Orbs on the field. Some teammates have Skills that change Orbs on the Orb field to different types, whether it be a single Orb type (changing Heart Orbs to Dark Orbs), or two (changing Light Orbs into Wood Orbs and Heart Orbs into Fire Orbs). Some Orb changing Skills can change the entire Orb field into several Orb types or even a single one (i.e. Iggy's Hurricane and Ludwig's Volcano). During courses, player may occasionally encounter a branching path in a course, with two different colored Orbs hovering above each path, representing which Orb color the player needs to clear most of from the Orb field to take its path: for example, if the player wishes to take the path with a Fire Orb above it, they will need to clear more Fire Orbs than other Orb types to proceed. The player will remain at the branching path until they clear either Orb colors at that branching path, and the player's Skill counter will not decrease until they do so (the player can use Skills that change Orb types, however). What appears at the path can vary from signs, Warp Pipes, to Gold Blocks. Proceeding on a path with a sign allows the player to continue on the "main" path, while entering Warp Pipes takes them to different areas before returning to the main path. Gold Blocks in branching paths do not show which Orb type the player needs to clear most of, but clearing with the right Orb type will cause the Gold Block to produce a Beanstalk, taking the player to another area. If the player clears the same amount of Orb types for a Gold Block as a Warp Pipe or a sign, the player automatically takes the path of the latter instead. Each course has a certain configuration of Orbs on the Orb field. All six types of Orbs can appear at once, though some courses may disable elemental Orbs or even Heart Orbs. 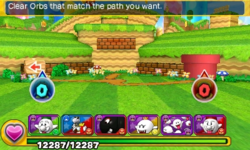 In several courses, some branching paths require an Orb color that is not present on the Orb field, and thus requires the player to bring an ally that can change Orbs into that color. The following is a list of the five attributes of the Orbs, and the teammates the attributes are designated to. Teammates are displayed as cards, with the color of the card matching their attribute (as well as the Orb type on the top-left corner of their card). If a teammate has a secondary element, or sub-attribute, it appears on the bottom-right corner of their card. The attack power of a teammate's sub-attribute is one-third of their base ATK (or main attribute) if they differ, and 10% if both attributes match. Teammates are listed according to their main attribute, their sub-attribute (if any), then the order based on their entry number from the Guide in the game's menu. Represents the element of fire, and inflicts Fire damage. Generally wielded by red-colored or clad, fire-using, or heat-dwelling teammates. Strong against Wood attribute enemies (150% damage), weak against Water attribute enemies (at 50% damage). Inflicts normal damage against Light, Dark, and other Fire attribute enemies. There are 33 Fire attribute teammates in the game with Fire as their main attribute, and 22 with Fire as their sub-attribute. Represents the elements of water and ice, and inflicts Water damage. Generally wielded by blue-colored or clad, ice-using, or aquatic/ocean-dwelling teammates. Strong against Fire attribute enemies (150% damage), weak against Wood attribute enemies (at 50% damage). Inflicts normal damage against Light, Dark, and other Water attribute enemies. There are 34 Water attribute teammates with Water as their main attribute, and four with Water as their sub-attribute. Represents the elements of wood, earth and wind, and inflicts Wood damage. Generally wielded by green-colored or clad, plant, rocky, or forest-dwelling teammates. Strong against Water attribute enemies (150% damage), weak against Fire attribute enemies (at 50% damage). Inflicts normal damage against Light, Dark, and other Wood attribute enemies. There are 37 Wood attribute teammates with Wood as their main attribute, and fourteen with Wood as their sub-attribute. Represents the elements of light and electricity, and inflicts Light damage. Generally wielded by yellow-colored or clad, flying, golden, or heroic teammates. Strong against Dark attribute enemies (150% damage). Inflicts normal damage against Fire, Water, Wood, and other Light attribute enemies. Light teammates are susceptible to paralysis from the Light Bind Skill used by Buzzy Beetles, Bony Beetles, and Big Bony Beetles. There are 39 Light attribute teammates with Light as their main attribute, and twenty with Light as their sub-attribute. Represents the element of darkness, and inflicts Dark damage. Generally wielded by purple-colored or clad, dark-dwelling, undead, metallic, or villainous teammates. Strong against Light attribute enemies (150% damage). Inflicts normal damage against Fire, Water, Wood, and other Dark attribute enemies. Dark teammates are susceptible to paralysis from the Dark Bind Skill used by Para-Beetles and Heavy Para-Beetles. There are 35 Dark attribute teammates with Dark as their main attribute, and fourteen with Dark as their sub-attribute. Heart Orbs represent life recovery and are not assigned to any teammates. When the player's team takes damage, Heart Orbs can be cleared from the Orb field to recover their HP, based on their teammates' total RCV values. The more Heart Orbs are cleared within a single turn, the more HP is recovered. Several teammate Skills can create Heart Orbs on the Orb field, and the Awoken Skill Recovery Boost can increase the healing power of Heart Orbs whenever they are cleared. In some courses, Heart Orbs are disabled from the Orb field and are named Heartless Courses. Metal Mario with a Fire and Light Orb. The items before being encased in Orbs. Super Star magically fusing with an original Light Orb. Orbs from the Puzzle & Dragons series. The various effects corresponding to different Orbs. In order: Fire, Water, Wood, Light, and Dark. This page was last edited on April 8, 2019, at 01:01.